I always wanted to learn how to make good Italian pizza recipes. I think they are also a love of most of us. I am going to share with you one of my best kept secrets. You might think I am selfish for keeping this little local pizza restaurant to myself but it was too small to share. Now it has been remodeled and made larger so I am willing to share it! This restaurant has many delicious pizza recipes and other traditional Italian foods. 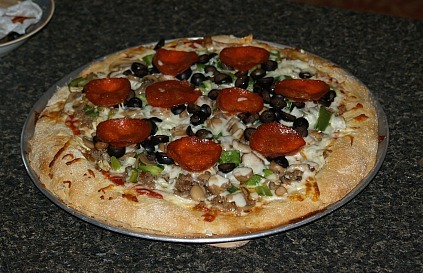 Sammy’s Italian Restaurant & Pizza is located on Route 200 in Ocala Florida. If you are traveling Route 75, take exit 350 and go West on 200 for 3 miles. It is located in the Jasmine Plaza on the left hand side of the road. It is worth taking a few extra minutes to drive to Sammy’s to experience their delicious food and Italian dessert recipes. These owners really learned how to make delicious Italian pizza recipes. They share a little history of Sammy's with their diners on the menu. He has dedicated himself to Italian food ever since he lived in Italy picking olives as a boy. He was inspired by authentic Italian food. His father brought the family to New York where they lived for twenty four years. Sammy vacationed in Florida with his wife and children. In 1994, after visiting a cousin in Ocala, he decided to open a restaurant. Absolutely the authenticity of Italy is present at Sammy’s and also the hustle of New York is present in the service. This restaurant learned how to serve these these Italian pizza recipes with their many salads. My favorite is the Greek salad which comes in two sizes. Both sizes are larger than you might think and are nice to share at a table. This is the best Greek salad you can find. Besides lettuce, tomatoes, cucumbers and onion, it has ham, cheese, feta, stuffed grape leaves, olives, peppers and house dressing. You are not limited to the Greek salad because there is also a garden salad, antipasto, chef salad, chicken strip salad and a tuna salad. Besides serving wonderful Italian pizza recipes, Sammy’s offer their diners a complete Italian food menu. One of my favorites is their red snapper recipe. The filet is sautéed in a light wine and lemon butter sauce and served with broccoli. More of my favorites are the chicken parmesan and veal parmesan; also chicken Marsala and many of the pasta dishes. These are only a few dinners from their extensive menu. If none of this is what you are craving, there are also choices of great tasting hot and cold sandwiches. The menu includes meals for children and wonderful Italian desserts like tiramisu, zeppolis and the cannoli recipe. The following is my pizza dough recipe for my favorite Italian pizza recipes. Traditionally pizza is baked directly on bricks or on tiles to make the crust crispier than it is possible to get it by baking it on metal pans. The oil seems to get trapped and fries the crust producing this crispness. Sometimes I heat my large iron skillet with a little olive oil; when it is hot I (CAREFULLY) place my rolled pizza dough in it. Then I quickly add the other ingredients and get it into the oven to bake. This method also allows the crust to fry making it crisper. In a large bowl dissolve 1 package active dry yeast in 2.3 cup warm water (110F degrees). Let stand for 5 minutes. Stir in 2 teaspoons sugar, ½ teaspoon salt and 3 tablespoons olive oil. Add 1 1/3 cups flour and mix to blend. Beat until dough is elastic. Add enough flour to make soft dough. Turn dough out onto a floured board and knead until smooth (10 minutes). Place in a greased bowl, turn dough to grease top. Cover and let rise in a warm place until double (40 to 45 minutes). NOTE: At this point I like to refrigerate the dough for several hours or overnight. I like the end result of the product if it has been refrigerated. 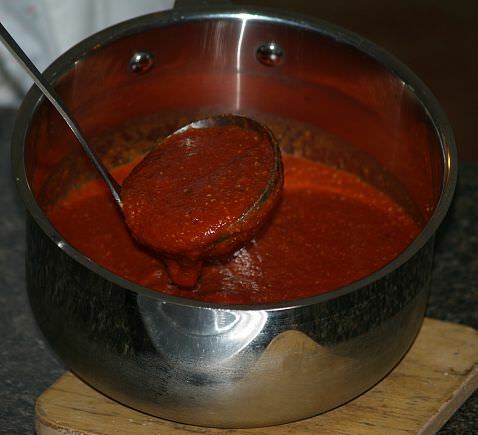 The following is my recipe sauce for good Italian pizza recipes. We all have favorite toppings to make our ideal pizza. If you like sauce on your pizza, the careful blend of adding the ingredients and the simmering to make it thick is what produces that wonderful flavor. In a heavy sauce pan heat the oil and sauté’ the garlic, onion and basil. Add the tomato sauce, tomato paste, oregano, salt, pepper and sugar. Bring to a boil, reduce heat, cover with lid and simmer for 20 minutes. 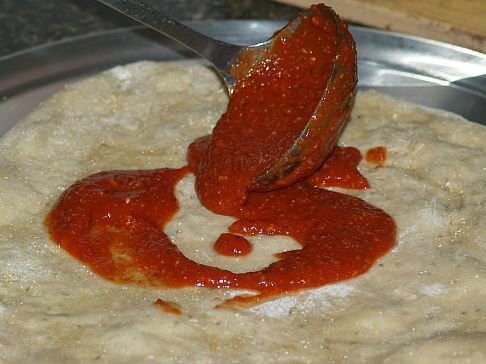 NOTE: try this sauce with the pizza dough recipe for your next Italian pizza at home. Let us know how it turns out. This marinara sauce recipe is light and great over pasta. In a large heavy saucepan, heat the oil and sauté’ the onion, celery, carrot, garlic, basil and parsley for about 5 minutes. Add the tomatoes, sugar, salt and pepper and blend. Bring to a boil, cover with a lid and simmer for 30 minutes. TO MAKE FILLING brown ground beef and sausage with the onion. Remove from the heat and drain off the fat. Combine tomato sauce, chili sauce, eggs, salt, paprika, chili powder, oregano and pepper. Add meat mixture to the sauce mixture and blend well; set aside. Prepare and set aside in separate bowls the olives, peppers and cheese. TO MAKE BREAD CRUST sift together flour, baking powder and salt. Cut in the shortening until particles are fine. Beat eggs in measuring cup; add enough milk to make ¾ CUP. Add eggs/milk to flour mixture; mix until smooth. Divide dough into three parts; press 1 part in bottom of ungreased 12X8 inch pan. Roll remaining 2 parts to a 16X12 inch rectangle; cut in half. NOTE: You will have 2 rectangles (Each 8X12 inches). Spread HALF of the meat mixture over crust in prepared pan. Sprinkle with HALF of the shredded cheese; top with half of olives and peppers. Top with a rectangle of the rolled dough. 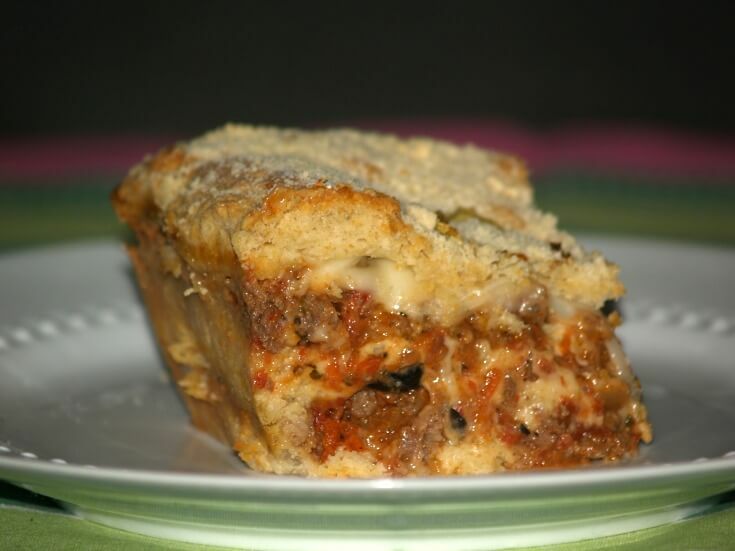 Repeat with layers of cheese, filling, olives and peppers. End with last layer of rolled dough; brush top with milk and Parmesan cheese. 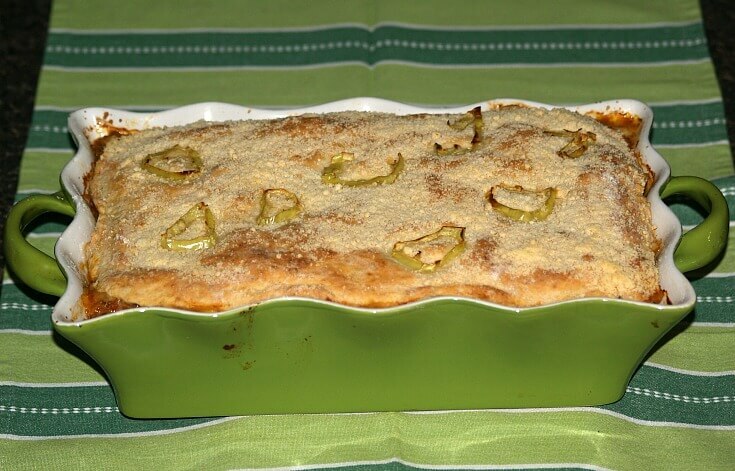 Bake for 20 to 25 minutes and serve hot; 8 to 10 servings. Combine tomato and ¾ teaspoon of salt in small bowl; cover and let set 30 minutes. Drain tomato and gently press between paper towels to remove excess moisture; set aside. Sauté leeks in butter and 2 tablespoons olive oil in a large skillet over medium heat. Stir constantly for 10 minutes or until leek is tender; set aside. Peel shrimp and devein; cut shrimp in half lengthwise. Combine the shrimp, 1 ½ tablespoons olive oil and a dash of each salt and pepper. Cover shrimp mixture and let stand 15 minutes. TO PREPARE PIZZA pat pizza dough evenly into a lightly greased pizza pan (12 inch). Brush crust with 2 teaspoons olive oil; sprinkle dough with feta and Gruyere cheeses. Top with leek and tomato; bake for 10 minutes; drain shrimp and arrange over the pizza. Sprinkle with Parmesan cheese and mint; serve immediately. Bake 3 to 5 minutes longer until crust is golden and shrimp turns pink. NOTE: This is enough for 2 pizzas (12 inches); filling below is for ONE pizza. TO MAKE CRUST combine 2 cups of flour, yeast, salt and warm water. Beat on high speed of mixer for 3 minutes scraping down sides of bowl. Stir in another 1 ½ cups of flour; knead 3 more minutes. NOTE: If dough is still sticky knead in more flour to form a stiff dough. Place dough in a greased bowl turning to coat; cover with plastic wrap. Let rise in warm place until doubled in bulk about 40 minutes. Punch dough down and turn out onto lightly floured board; divide in half. Roll each part into a 13 inch circle; place on lightly greased pizza pans. Fold edge of dough over to form a ridge; add filling. NOTE: Make 2 pizzas by doubling recipe below or wrap 1 tightly in double plastic wrap and freeze up to 2 weeks.). Bake in PREHEATED OVEN AT 450F degrees for 20 to 25 minutes. FOR FILLING spread crust with tomato sauce; sprinkle with cooked sausage. Top sausage with onions, mushrooms and mozzarella cheese. Combine Parmesan cheese and herbs; sprinkle over the top.